What better way to appreciate family and increase social awareness at the same time than learning about family traditions? Social awareness is the ability to take the perspective of and empathize with others, including those from diverse backgrounds and cultures. The ability to understand social and ethical norms for behavior and to recognize family, school, and community resources and supports (CASEL). 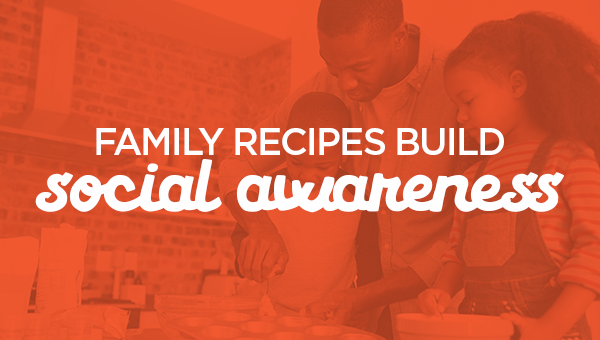 How could you use the video Family Recipes to learn about your families? Another fun ReadyRosie Modeled Moment that helps you learn about your families is Favorite People Place Cards. Thanksgiving is a perfect time to create name cards. It is a fun way to get to know the different family members and build social awareness at the same time. The ability to empathize with others is another aspect of social awareness. While many of our children have more than enough to eat, many do not. Empathy is the ability to understand someone else’s feelings or situation. What would it be like to be that person. When we have empathy, we are more thoughtful and caring. In the Hunger and Empathy campaign, Scholastic discusses a “feeling faces” game. Draw several emojis that would represent feeling sad, surprised, happy, angry, etc. Ask questions that begin with how do you think a friend would feel if …? Help the child choose the appropriate feeling and discuss.